With this news, I see it fitting to start this thread. Conti Tire exits after 2018 season, wonder who will be the new supplier, or will it be open? We can dream but open tyre competition ain't gonna happen. Hoosier is Conti owned nowadays correct? If so, that leaves Michelin, Pirelli and Dunlop I guess. I'd prefer Dunlop outta those, simply for the giant sidewall markings. It might... Probably not though. Yes, Hoosier builds the Conti race tires. Dunlop and Pirelli have tiny market shares here, although Dunlop is a Goodyear company. Michelin would be the obvious answer to me. Signs are pointing towards Michelin. Is Bridgestone/Firestone an option? Yokohama? Hankook? My thoughts: Iit will still be a single tire class for P class and GTD. Now the Conti defenders often said to the Conti critics that the crap tires were built to a spec that the series organisers wanted. So even if Michelin was awarded the contract, I won't hold my breath of a better tire built. The P2 cars from WEC were 2-3 seconds faster at COTA this year than DPi. I don't think Michelin would take up the contract if it was built to a spec that wasn't their own. The big 3 in North America are Goodyear/Dunlop, Bridgestone/Firestone and Michelin, with over 50%. Conti is fourth with just 6%. Goodyear is in Nascar and Firestone in IndyCar, so it makes sense for Michelin to become an IMSA partner. However, I wouldn't be surprised if Dunlop or Bridgestone made a decent bid. If Michelin gets the contract, I'd assume their current P2 tires (or an updated version of them) would be the tire of choice for the P class. They would probably employ the current GTE tire strategy in the future as well for GTD. Also, this end of the Conti contract means the end of the sponsorship for the 2nd tier championship. I wonder if the new tire contractor will be required to sponsor said championship or if an outside sponsor will be found. They would sponsor what is now the CTSCC and Prototype Challenge. 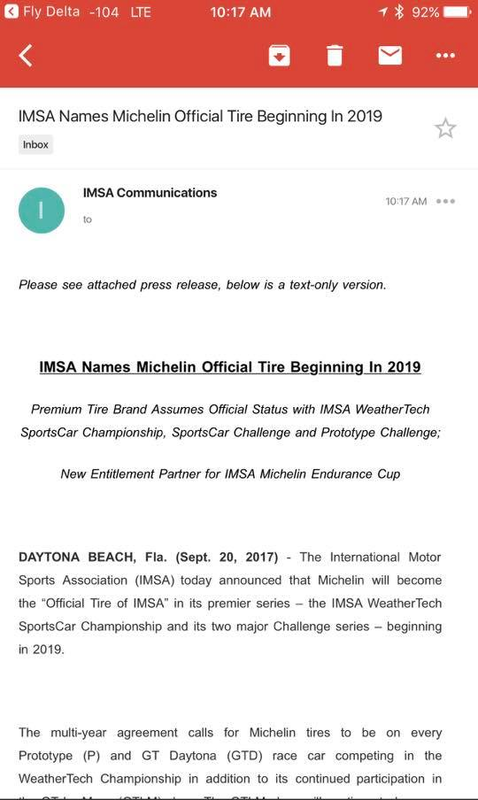 SC365 and Racer Magazine also reporting the IMSA press release on Michelin replacing Continental. "The 2019 IMSA Michelin SportsCar Challenge will feature the Grand Sport (GS) class for cars built to international GT4 specifications and Touring Car for TCR-spec race cars."